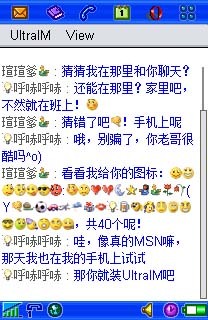 Share pictures with your MSN friends. if your device support JSR135(Mobile Media API) or JSR75(file system access), you can try UltraIM professional version. UltraIM Pro is the only mobile messenger that supports "MSN display picture" and utilizes the power of your camera phone. 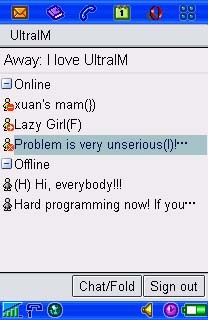 We do our best to make UltraIM like real MSN client continuously! The appearance and functionality of UltraIM imitate many features of MSN client on desktop, including sign in screen, contacts list and chat windows, etc... We hope to provide you with similar experience of using MSN client on desktop! UltraIM is real proxyless. Why proxyless is very important? It means you can connect as a standard MSN client without any compromise. And connecting to the public MSN network directly can save you money by reducing network flow significantly. In order to provide a fast, economical and full-functionality service, UltraIM connects you directly to the public MSN network, not via proxy server. Change in contact's icon for incoming messages NEW! Auto detected, scalable icons for high resolution phones (Nokia N80, N90, etc...) NEW! UltraIM Instant Messenger is for all Java MIDP 2.0 phones.